As you might have noticed, I'm a cartoonist. And I'm still a cartoonist, but last night I retired from regular weekly freelance alternative political cartooning after eight years of doing it professionally (and another four before that). I've been considering this seriously for over two years now, but I'm not ashamed to say that when I came to my final decision yesterday and notified my major remaining clients via email there was indeed some uncontrollable sobbing on my part. I explain my decision in excruciating detail here, but in short: I was doing too much work for too little reward, getting far too many abusive comments and emails, and I needed to make room for more positive projects and people in my life--such as sewing, and most importantly of all, my daughter-to-be. I'm going to be going back to work full-time after a 12-week maternity leave, and if I'm barely able to motivate myself to do freelance political cartoons now, I can't imagine I'll be more excited about it when I've got a newborn who needs as much love and attention as I can give her. 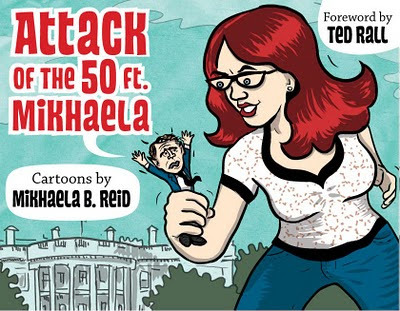 I will say that I was one of only a handful of regularly working paid women political cartoonists (who recently represented only 3% of political cartoonists as a whole) and now there are even fewer. But, as my Bobie (that's my grandma to you not of the Jewish persuasion) would say: "What can you do?" This relates to sewing only tangentially, but I thought I'd post about it here because in a small way starting this blog helped me realize this was something I should have done a long time ago. As I said on my 32nd blog post here, I was surprised to find that blogging could actually be a rewarding and positive activity... as opposed to a source of abusive comments and emails. Congratulations on making what I'm sure was a very difficult decision! Congrats to you! How freeing that must feel after so long toying with the idea. Thanks! I have the oddest feeling today--a mix of lightness and relief and shock and grief... It feels oddly like a break-up, actually! Well done for making a bold decision. Happy sewing! Sounds like the right decision. Onward and upward! What a big - but well-considered - decision. I imagine you may feel a bit surreal for a while. (But as a cartoonist, political or no, I'm sure you can relate to that! :-)) You deserve to hear positive things. Cartooning's loss is clearly sewing's gain! !